Fear Culture, 2007, Confiscated series, airport confiscated items, metal, plastic, resin, petri dishes, 66 x 80 in. The objects that Michele Pred assembles into installations or sculptures are sharp, provocative and metaphorically loaded—scissors, pocketknives, discarded cellphone chargers. “Each piece starts with an idea. The materials come afterward,” says Michele Pred, “as I discover them.” The conceptual artist develops her ideas by hunting for materials that embody her thoughts. More often than not, the objects that Pred assembles into wall installations or freestanding sculptures are sharp, provocative and metaphorically loaded—scissors, pocketknives, discarded cellphone chargers. Diverse elements advance her range of ideas, which centers on cultural identity, excessive consumerism and the connections between craft and technology. Pred’s hunt for visually compelling, symbolically rich materials has led her to places she never intended to frequent: New York City subway tunnels, eBay, airport security offices. More than once, Pred has climbed into dumpsters at San Francisco International, shovel in hand, to search through tons of scissors and corkscrews for particularly small pocketknives or pink sewing scissors. 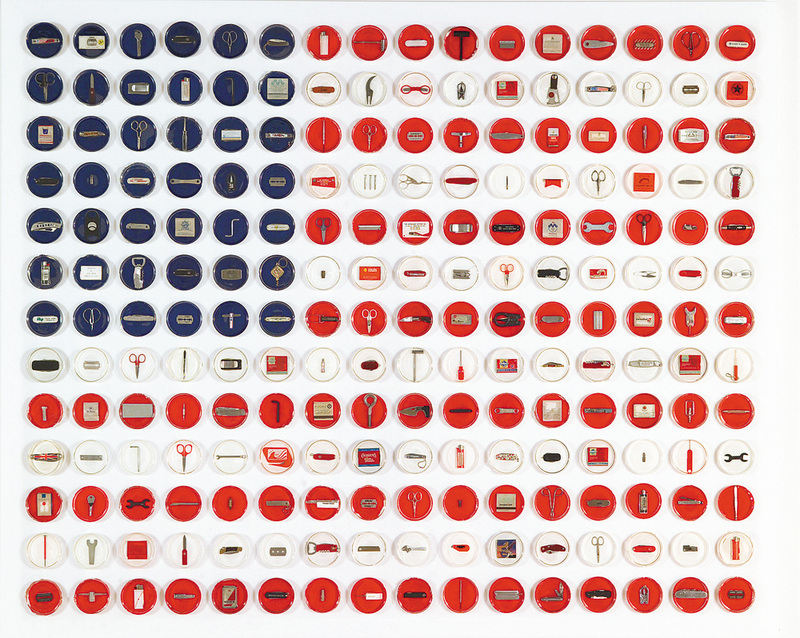 Such excavations resulted in Fear Culture, a 66-by-80 inch American flag constructed from confiscated razor blades, screwdrivers, scissors, lighters, matches and bottle openers. The piece is part of Pred’s Confiscated series, started in 2002 as a response to 9/11 and homeland security regulations. 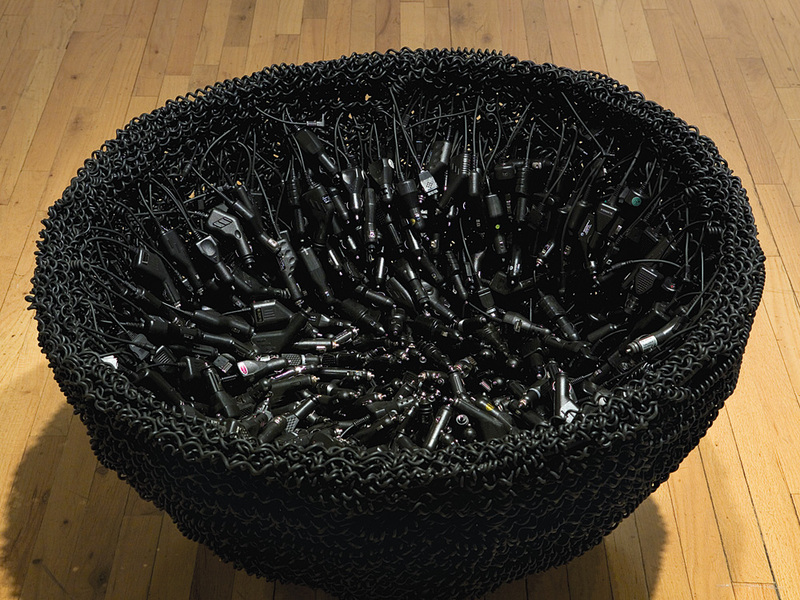 Each small, seemingly insignificant item—nail clippers, tweezers-embodies “the cultural residue of a particular moment in history,” Pred explains, and “the weight of a changed world.” Collectively, the 208 confiscated objects function as social and political commentary; individually, each evokes a more personal experience. Pred isolated and mounted each article in a petri dish, an object imbued with multiple layers of meaning in its own right, synonymous with scientific experiments and living, occasionally anomalous cultures—in this case, a culture of fear. The influence of Pop art—in particular the work of Robert Rauschenberg and Jasper Johns-is apparent in Pred's preference for found and discarded objects and for images such as flags and targets. Less obvious but even more notable is the influence of Pred’s father, a professor of cultural geography at UC Berkeley, and Pred's own childhood experiences sitting around the dining table listening to graduate students discuss economics, linguistics, religion, feminism and art. Consequently, Pred explores the nexus of personal, political and cultural identity with unusual ease in works such as San Francisco Grooms, a three-tiered pink wedding cake topped with two bridegrooms, and Hand Work, an installation comprising hand-knit pot holders she collected in thrift stores in Sweden. (Pred is half-Swedish and spent childhood summers in Scandinavia, comparing Swedish norms with U.S. conventions). Over the past eight years, Pred has worked with expired New York City MetroCards, old gas pump nozzles and airplane wings salvaged from junkyards. Security Blanket is a thin, flat, shiny wall piece elegantly crafted from an international selection of razor blades: Pakistani, Indian, Iranian, German, American, Japanese and Czech. Medusa is a 10-foot-long curly jumble of discarded cellphone chargers. Arranged side by side on a wall, the cellphone chargers resemble sci-fi palm fronds. “However ugly they may be individually,” Pred notes, “these mass-produced pieces take on an intriguing organic quality when placed together.” By placing familiar objects in a new frame of reference, Pred composes reflections on contemporary culture that are intentionally complex. In 2007, Pred began exploring the connections between craft and computer code. Working with black thread on white canvas, she hand-embroidered a 2-D bar code (the black-and-white geometric patterns that code the URLs of websites). In the act, she linked the ancient practice of embroidery with 21st-century technology; she also indirectly referenced the historical link between weaving and computing, which traces contemporary coding back to the punch card pattern-making system of the 19th-century Jacquard loom. Any cellphone with the appropriate application can read Pred's embroidered code and connect to an online message displaying the title You Are What You Buy. Pred explored the activist potential of her bar code a step further in 2009 with a print entitled Blue and Yellow 2D Barcode. On Black Friday, she shopdropped (the reverse of shoplifting in that one covertly places items in a store) 10 copies of Blue and Yellow 2D Barcode in a local ikea. That afternoon, she mentioned it on Facebook and the story went viral. Twenty-four hours later, all prints had sold, and Pred was contemplating the unanticipated, interactive dimension her work had taken. Blue and Yellow 2D Barcode had expanded her palette to include social networking—a virtual petri dish for the 21st century. The material of cyberspace was already developing her ideas in new directions. Mija Riedel writes about the arts, cultural icons and sustainability. She's currently working on a series of interviews for the Smithsonian's Archives of American Art. 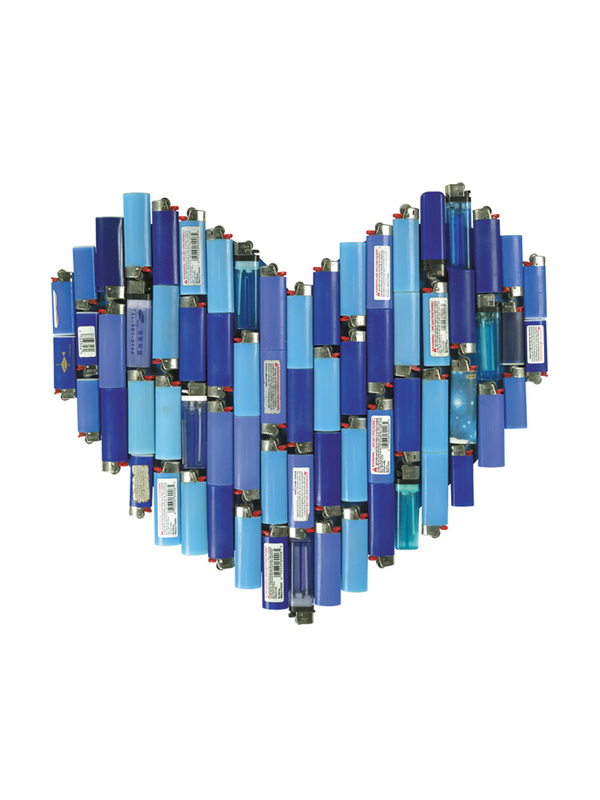 Blue, 2005, Confiscated series, airport confiscated lighters, 16 x 18 in. Nesting, 2004, car cellphone chargers, 24 x 36 in. Collection of the Contemporary Museum, Hawaii. 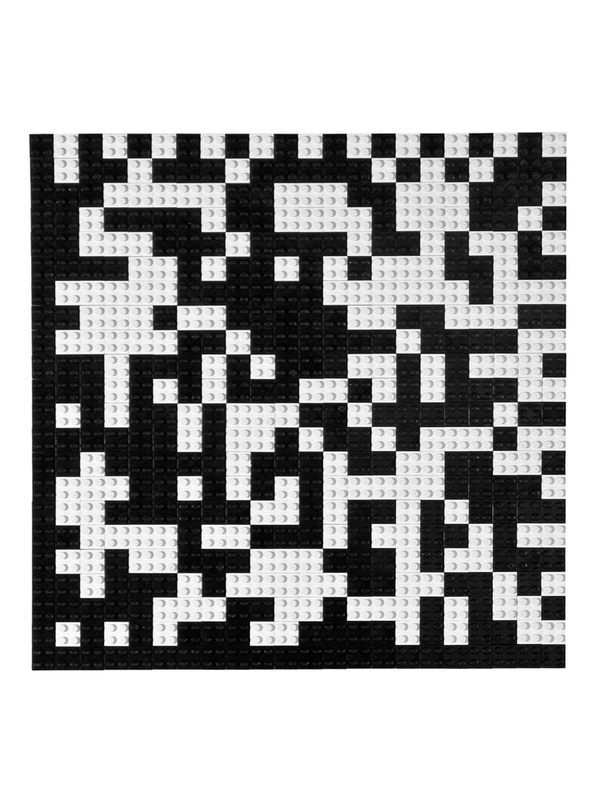 War Games, 2D Barcode, 2008, 14 x 14 in., legos. 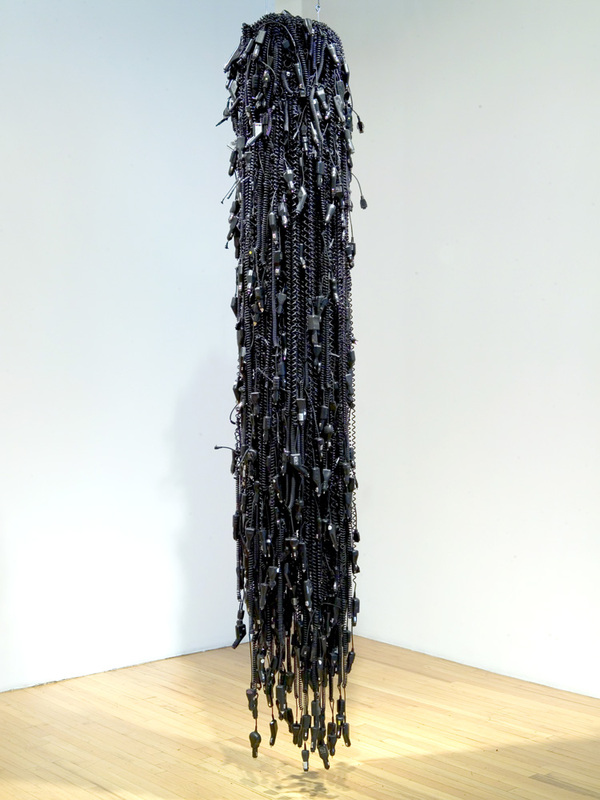 Medusa, 2004, car cellphone chargers, 120 x 22 x 22 in. 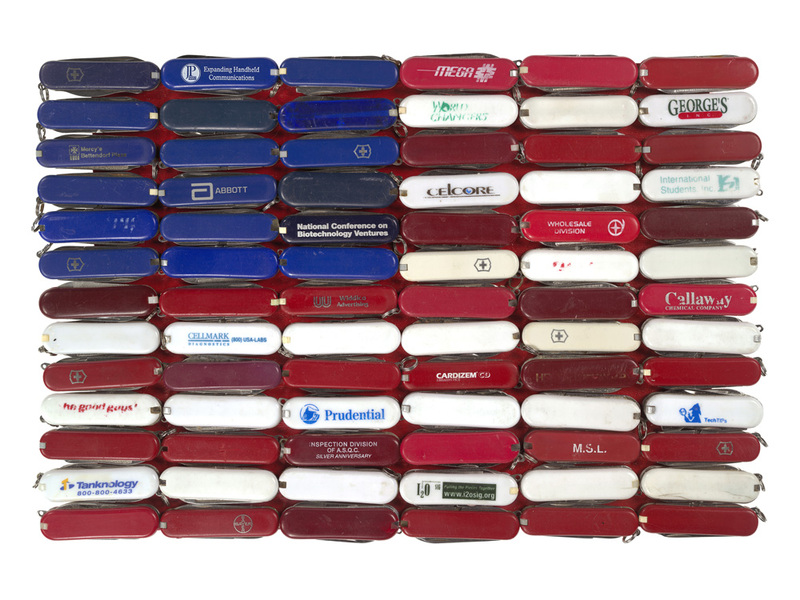 Homeland Security, Confiscated series, 2004, pocketknives, 9 x 13 in.